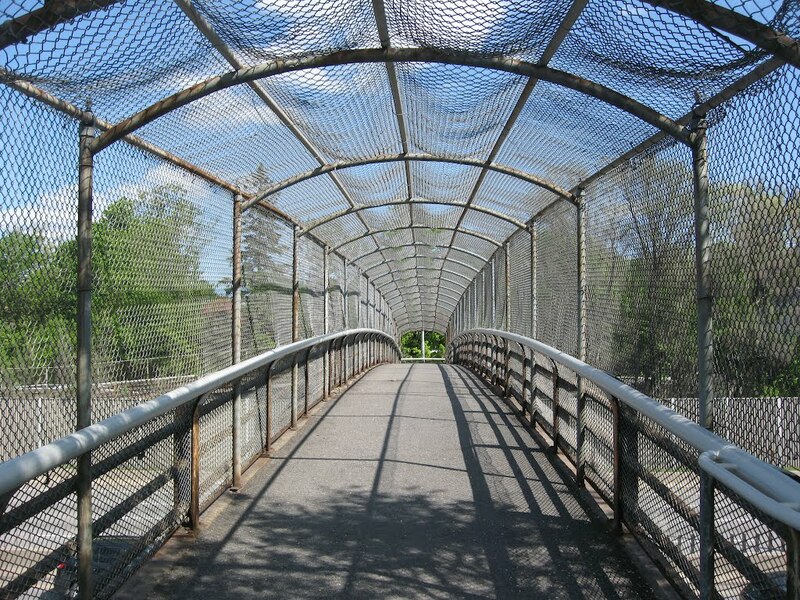 The Harmer Avenue pedestrian bridge has been a unique feature in Kitchissppi for the past 50-plus years. Built out of necessity due to the construction of the Queensway in the early 1960s, this little bridge is much appreciated for maintaining the linkage between the two neighbourhoods which border the Queensway. It is also a handy-cut through for pedestrians and cyclists looking to travel north-south through the community ,and most importantly, it was created to be (and continues to exist as) a safe, direct route for school children to travel to get to Fisher Park or Elmdale School. The pedestrian bridge will be in the news in the near future, as a planned replacement is scheduled for 2018. The RFP was put out this past summer, and the work has now been contracted out, with some minor work scheduled in January (according to Jeff Leiper's newsletter "minor repairs that include the installation of a fine mesh will likely be undertaken in mid-to-late January"). 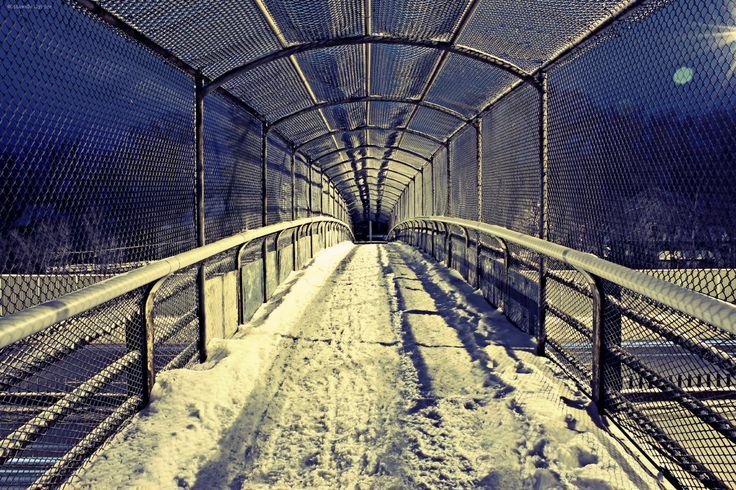 So I thought it would be fun to take a look back at how this pedestrian bridge came about, and its story through the years. 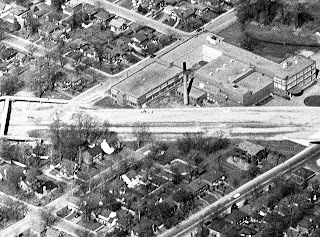 The Queensway was extensively planned throughout the 1950s, and by 1957, the plans were more or less finalized. In 1957, it was announced that the Queensway would be a "limited-access highway" with a series of interchanges at major intersections known as "clover-leaves" (where a driver can approach the Queensway from any direction and access it to proceed in either direction) or in more highly populated areas, via ramps. 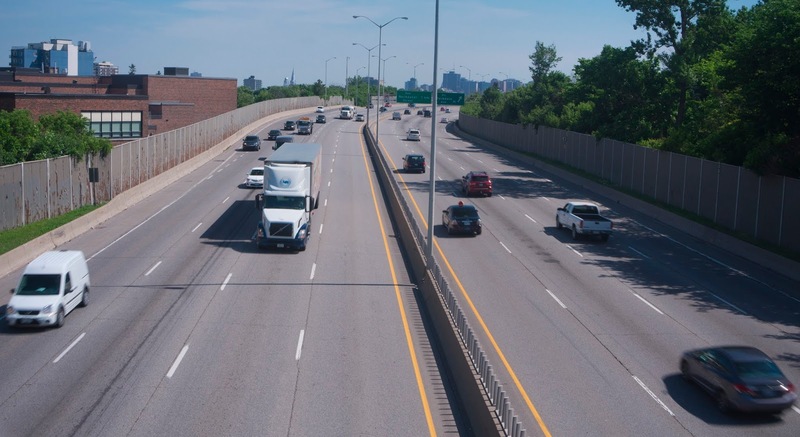 Also, it was announced which north-south streets along the route would have an underpass or overpass established (which included Main, Elgin, O'Connor, Bank, Lyon, Percy, Bronson, Booth, Rochester, Preston, Bayswater, Fairmont, Parkdale and Holland). It is interesting to note as well that Island Park was initially slated to be a clover-leaf interchange (joining Pinecrest, Woodroffe, Maitland, Carling-Kirkwood, Riverside Drive and St-Laurent). 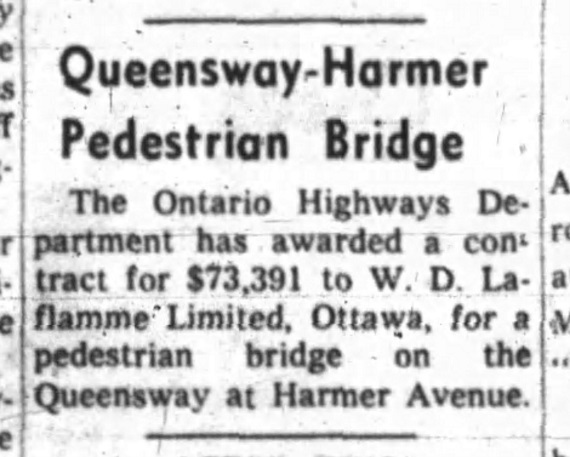 But included in the plans as well was one single pedestrian bridge along the entirety of the route of the new Queensway, envisioned for Harmer Avenue. 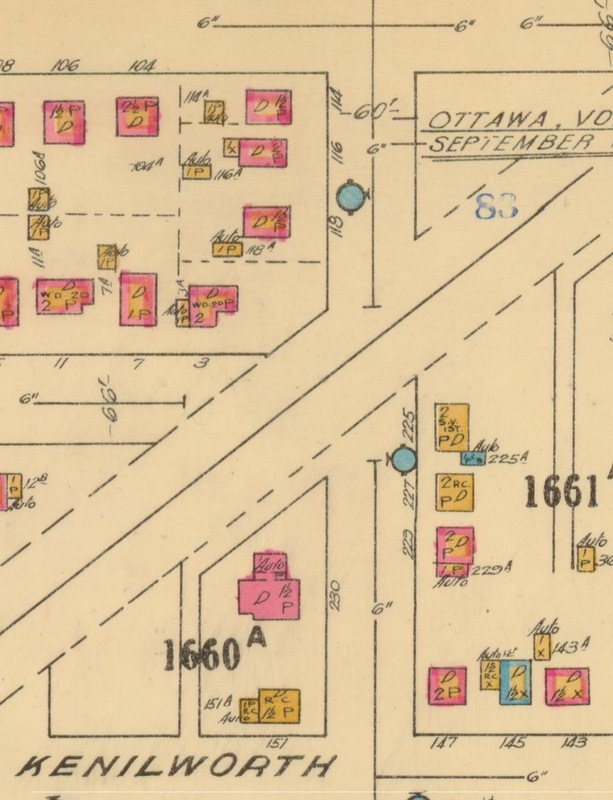 No doubt officials recognized that a large portion of the school populations for Fisher Park, Elmdale and St. George's Schools were children living just on the south side of the Queensway. The Queensway would have forced them to travel either west to Island park or east to Holland and backtrack. Not easy options, and certainly not a safe proposal either. Construction on the interchanges commenced in August of 1960. 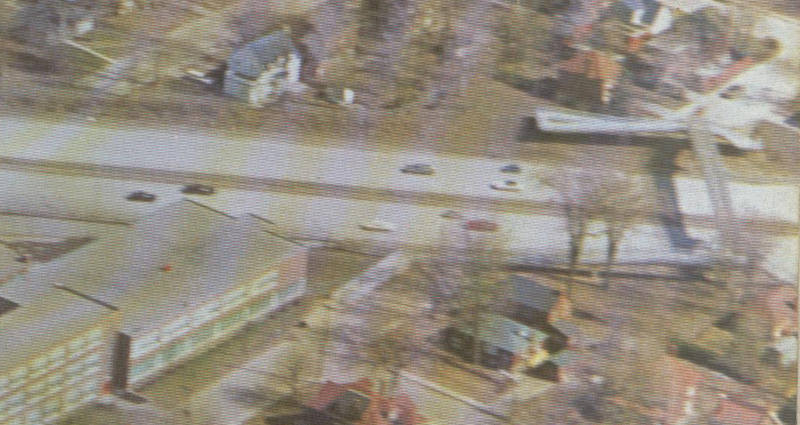 The Island Park Drive overpass was the first to be constructed, and Holland Avenue came soon after. IPD was closed for quite a lengthy period during the building of the overpass, and thus all IPD traffic was re-routed down Helena Street and onto Harmer, which had temporarily been opened as a through-street. However, three children were injured on Helena in the first few weeks of the detour, and with the start of the school year coming, more injuries (or worse) were feared. Traffic was also way too heavy for these small streets to handle (5,000 cars per day at the time), and made worse by the large number of trucks using the street to access the work site. 105 families on Harmer and Helena signed a petition urging the City to find another route. The city traffic committee visited the site, and considered the problem, but found there was no solution, other than stricter law enforcement to monitor speeding (15 mph limit), the erection of "a rash of slow down signs", and they eventually re-allowed trucks to use the closed Island Park Drive to access the worksite. On top of this, the committee also agreed to build "an asphalt footpath from Kenilworth to Harmer through the old railbed. This will afford a safe path for youngsters travelling to three schools in the area." This step helped lay the groundwork for the future pedestrian bridge to come. Where a thin railway line had previously run the route of the Queensway, much land was required on either side. As well, a little additional space was required to add the pedestrian bridge access ramps. As a result, there were five houses in the vicinity of Harmer Avenue that were demolished or moved to accommodate the new infrastructure. 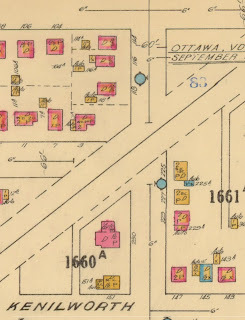 These houses can be best seen in the old fire insurance map below. These 5 houses included 118 Harmer and 3 Helena at the top (located where the north pedestrian bridge access ramp is now located, by Fisher Park), and a large brick house (230 Harmer), plus two small wood houses at 225 and 227 Harmer all on the south side where the south pedestrian bridge ramp now runs. a thin solid black line. 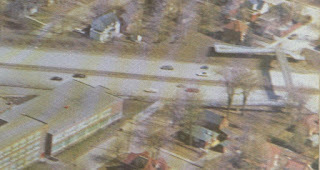 Aerial photo from 1965, showing the completed Queensway and bridge. Aerial photo from 2015 showing the same area as above. 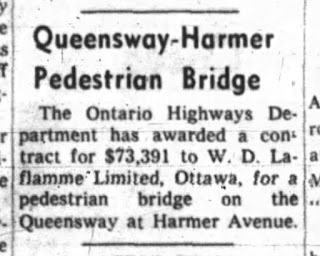 In July of 1962, the Ontario Highways Department awarded a contract for $73,391 to W. D. Laflamme Ltd., for construction of the bridge. By later in 1962, construction was underway on the pedestrian bridge, with the goal of having it in use by the summer of 1963. 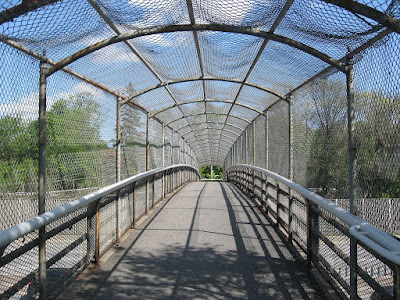 It was to be the first pedestrian overpass ever to cross a provincial highway in Ontario. The bridge was designed by the engineering firm of DeLeuw, Cather and Co. Ltd. The Journal of December 7th noted that it was to be 15 feet high, 10 feet wide and 180 feet long (the bridge ended up being closer to 25 or 30 feet in height), and would have a budgeted cost of $90,000. The end result was a 122-foot span of pre-stressed, pre-cast concrete, with ramps at either end specifically designed with baby carriages in mind. The final actual cost was $125,000. 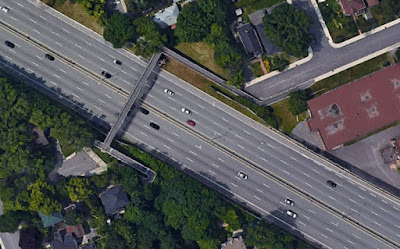 The photo below just barely captures the pedestrian bridge at the left edge of the photo (this photo is cropped from a much larger oblique air photo taken of the neighbourhood, hence the somewhat low resolution). The bridge would appear to be completed, I think I even see two figures walking on the north approach. The Queensway itself is just base at this point. The bridge was in use for quite a period (over a year) before the Queensway was finished. Despite that, it did not take long for safety concerns to arise. The walkway was not enclosed, and featured only basic railings. 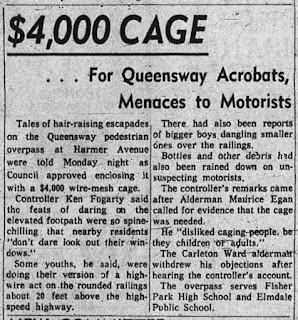 Local Alderman Ken Fogarty in the summer of 1963 expressed concern that it would prove "too much of a temptation for youngsters" adding "somebody is going to climb the rails and fall 35 feet to the Queensway". He noted that children were already climbing the rails on the overpass, and that once the roadway beneath were to be opened, the threat of danger would be all the more increased. He urged Council to add screening to prevent falls. However, no modifications were made at the time. On May 18th, 1964, the Queensway opened to vehicles for the first time between Carling/Kirkwood running east to O'Connor Street. The photo below was taken just a couple of days after the opening, and shows well the lack of safety on the bridge itself, and also its popularity in the early days. I imagine when the Queensway first opened it would have been quite a highlight for schoolkids to stand on the overpass and observe the fast-moving traffic, which was new to Ottawa. Queensway looking west, just a little east of Fisher Park School. Queensway looking east, September 1964. 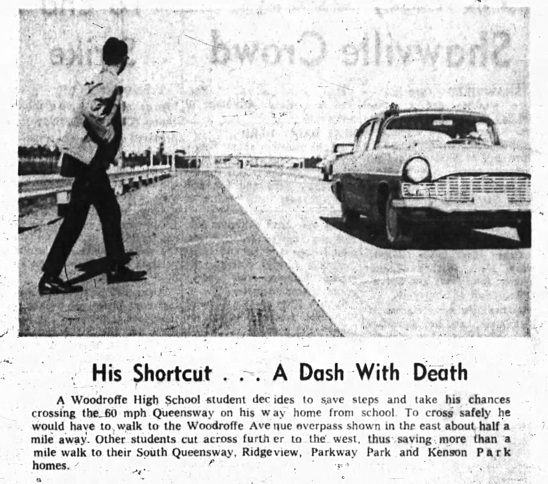 In November of 1964, Alderman Ken Fogarty again fought for a covering or the raising of the protective wiring to prevent what he called "acrobatic displays" on the overpass. Further of concern was the throwing of snowballs and other objects onto the traffic below. 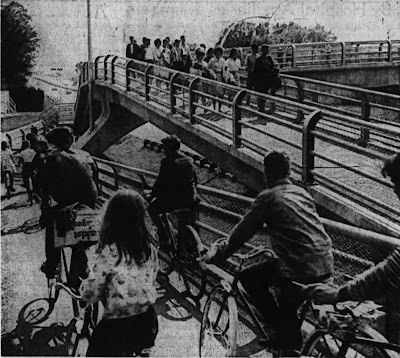 The Ottawa Council of Home and School Associations later added their voice of support, urging in March of 1965 for the overpass to be "fenced in completely" in a letter to the Ottawa Police Department. The need for standardizing safety on the overpasses was of immediate concern as the City contemplated added more pedestrian bridges in other areas. 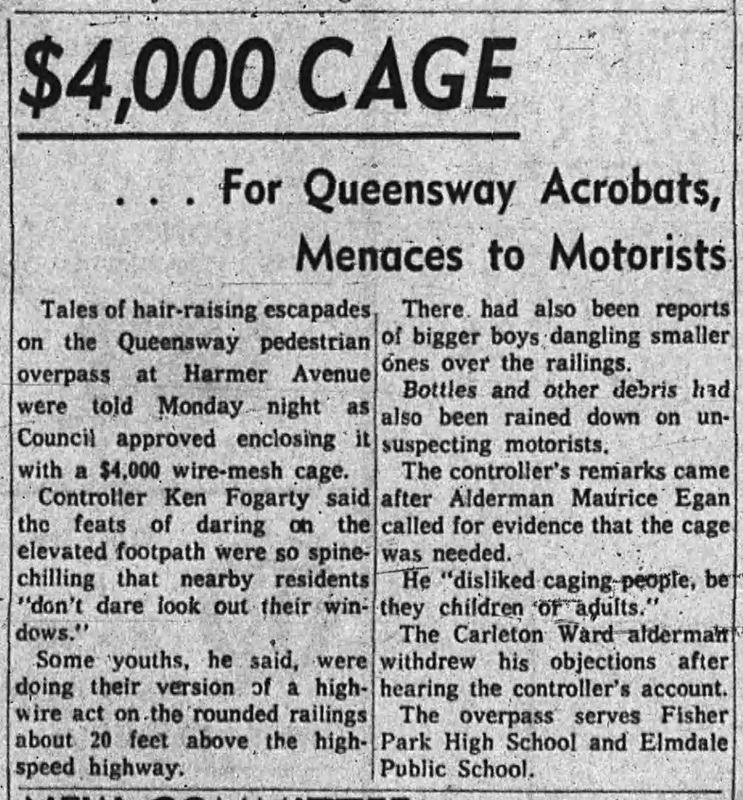 Finally, the Board of Control on April 29th, 1965, after a recommendation from Police Chief Reg Axcell, approved plans to put a cage over the bridge, at a cost of $4,000. City Council approved it the following Monday. The newspaper coverage elaborated even further on the risky actions that kids were undertaking, including reports of "bigger boys dangling smaller ones over the railings"! The fence however was not installed right away, and was put off repeatedly by the works department throughout the summer and fall. The fence finally went in on October 14th, 1965, at a cost of $1,700. By late 1971, just nine years after the overpass was constructed, it became evident that there were faults in its construction, and had deteriorated quicker than anticipated due to salt and weather. 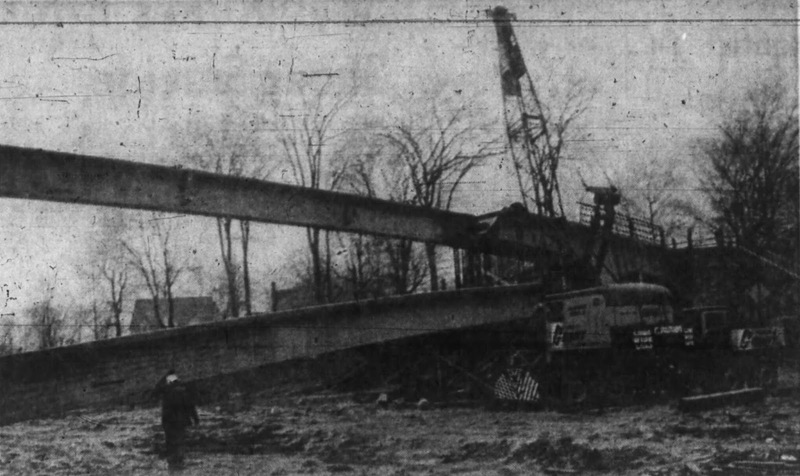 The City hired the original engineers (DeLeuw, Cather and Co. Ltd.) to examine the bridge and make any necessary repairs, after a large chunk fell from the overpass onto the Queensway. Fortunately no accident occurred, but it was cause for concern for motorists and pedestrians alike. 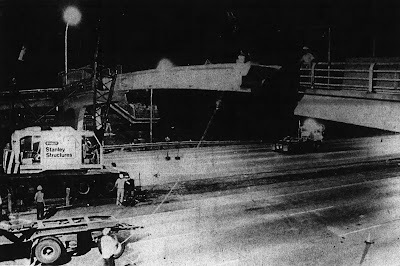 The firm repaired the bridge, but evidently by 1977, it was decided that the entire pedestrian bridge would need to be replaced due to structural weakness. The City put out a call for tenders for the job in July, and three bids were received. However, the Board of Control rejected all three bids, stating that the estimates were too high. 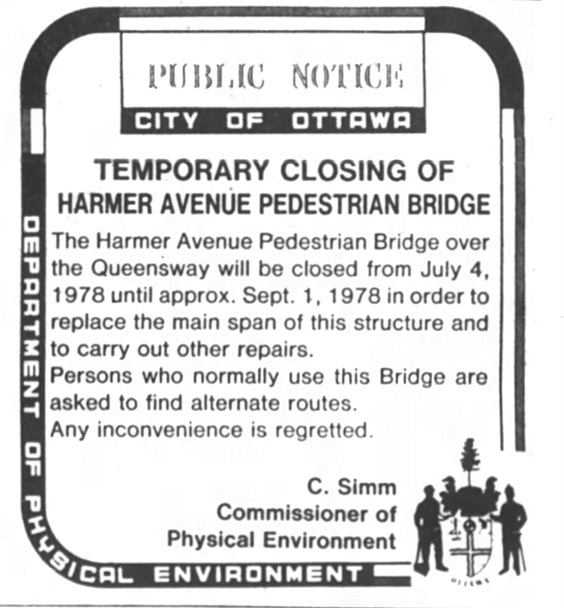 Thus the City decided to spend $40,000 to patch the bridge, and go back to tender in 1978. Replacement was finally ready to begin in July of 1978. 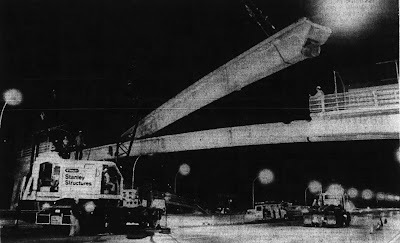 Then two nights later, on Friday July 21st, 1978, the new pedestrian bridge was installed in the middle of the night, in just two hours. Two new 78-foot beams, each five feet in width and made of pre-cast concrete had been transported from Belleville on specialized trucks, raised into position by an enormous mobile crane, and then fastened with tie rods. Somewhat surprisingly, only 25 people from the neighbourhood ventured out at two in the morning to watch. 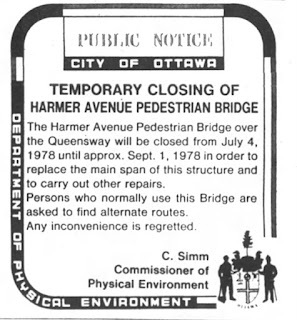 In the summer of 1989, the bridge closed once again (from June 26th until the first week of September) for significant repairs, again owing to the quick deterioration of the "concrete bridge support-structures, deck and ramps, according to a City of Ottawa engineer at the time. I could not find any other information on any other changes or work done to the bridge since. 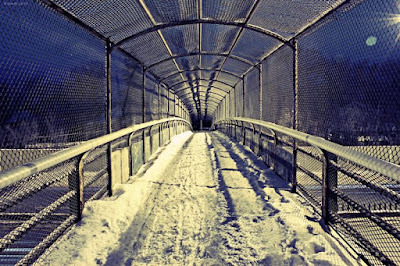 So there you have it - the detailed history of the pedestrian bridge! So when you see the new one installed in 2018, you'll now know it actually the third bridge to exist in this location since it was first built in 1962. A well-appreciated piece of Kitchissippi infrastructure that thankfully will survive on into the future! pedestrian bridge in June 2016. Photo from May 17, 2012. Date unknown, found on Pinterest. Really interesting and well-done piece, Dave - - lots of intriguing bits of info. Seems strange today that, in the early days of the Queensway, there seemed to be more than a few people who considered running across it a reasonable option! As you describe, though, somewhat understandable given context at the time.